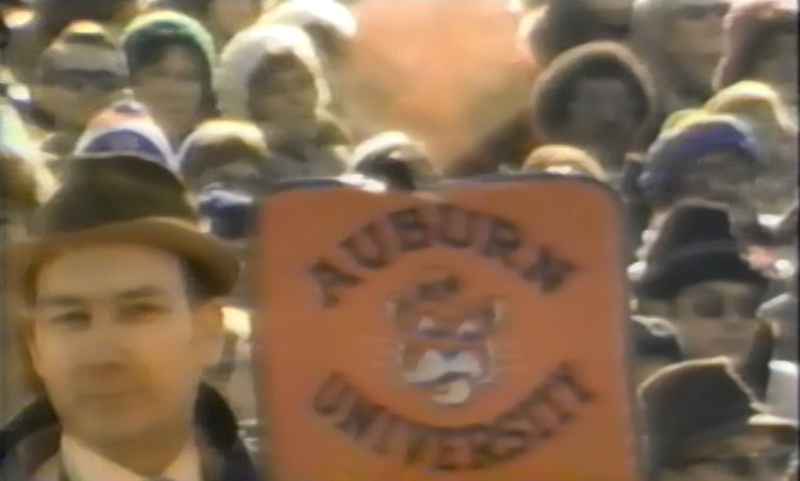 Our old friend Allen Spain was just being our old friend Allen Spain yesterday, preparing for the BCS title game by watching Bama lose again to Notre Dame in 1976, and just generally relishing his mysterious access to seemingly every ABC college football broadcast in the 1970s. And as the cameras briefly panned the Notre Dame Stadium crowd, there he was, with his hat and seat cushion and Mona Lisa smile—a sun-drenched Auburn angel à la Glenn Close in The Natural. We’ll be looking for him tomorrow night. You gotta believe. Related: Auburn has a new hero. I still have that same seat cushion and take it to Auburn games! War Eagle!